Successfully Added LED Rope Light - Color Changing Flexible Rope Light (3M) to your Shopping Cart. Flexible color-changing LED rope light in 3M length used to illuminate displays, signs, trees, or other small items that need decorated with light. Installation is very quick and simple, you can wrap the rope around your landscape plants, use u-shaped style staples to attach it to architecture, or use clear silicone gel to attach it concrete and other surfaces masonry surfaces. 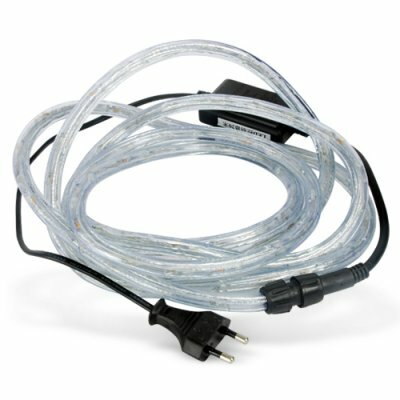 No special tools or wiring is required to install this model of LED Rope Light. Make your indoor and outdoor spaces shine with this Multi-Color LED Rope Light. Our model CVHZ-G81 is a commercial grade lighting product available to you at a factory direct price. It is in stock right now, order yours now to enjoy the benefits of affordable architectural lighting! Yes. It can be used in any any tree. Note that this model is only 3 meter long, so it is better to use on smaller garden plants.